The Gandia – Ibiza route is a popular ferry connection between the mainland of Spain and Ibiza, one of the Balearic Islands. The ferry crossing between Gandia and Ibiza used to be only a seasonal connection. 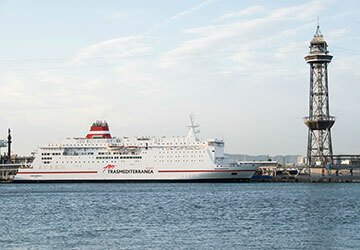 However, since 2018 the ferry company Trasmediterranea offers a service on this route, running all year long. It is one of the fastest and most direct connections to Ibiza. The destination is the town of Ibiza directly, rather than San Antonio, which was previously the port where ferries from Gandia would dock. Prices shown represent the average one way price paid by our customers. The most common booking on the Gandia Ibiza route is a car and 1 passenger. The crossing time is between 2.5 and 4 hours long (depending on the ferry used for the sailing) and is offered on a schedule of 4 sailings a week. The check-in time is 120 minutes before the departure. The new vessel operating the Gandia – Ibiza crossing is the Volcan de Tijarafe, previously owned by Naviera Armas. The fast-ferry offers space for 1000 passengers and up to 300 vehicles. Pets can travel free of charge in your own carrier or can be accommodated for a fee in a kennel on board and must be booked in advance to guarantee space on the ship. Why travel on the Gandia – Ibiza route? Gandia ferry port has a brand-new terminal opening in 2019. This new terminal will make boarding faster and more comfortable both for foot passengers and people travelling with their cars. The departure port of Gandia is conveniently located between the popular tourist cities of Valencia and Alicante and so easy to reach from whichever direction you come from. If you are coming from Barcelona, you can reach Gandia in roughly 4.5 hours. The town of Ibiza is the perfect start point to explore all the island Ibiza and also if you want to take another ferry to Mallorca, Menorca or Formentera, the other Balearic Islands. With Direct Ferries you can compare ferry routes, timetables and operators, you can find the cheapest ticket for the lowest cost and book easy and fast online. Head over to our price finder and start planning your Gandia – Ibiza trip now.